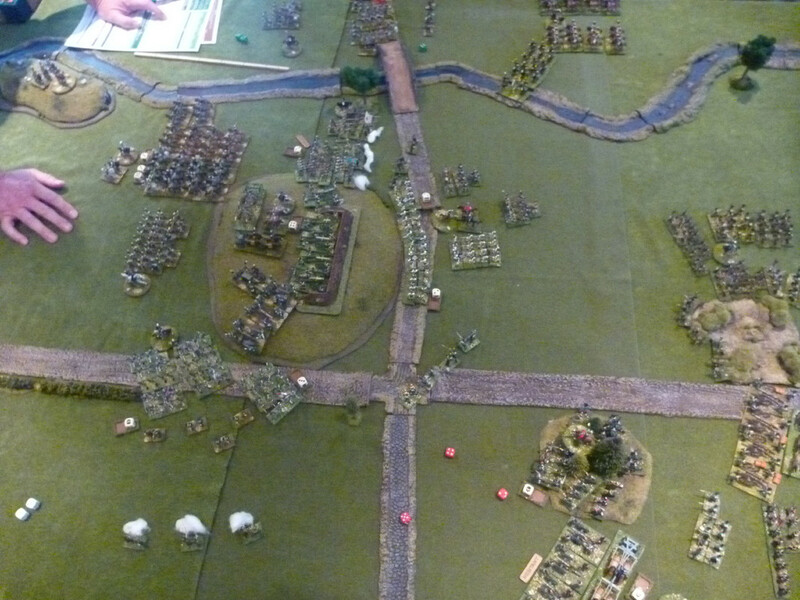 As advertised, we fought the smple scenario from the 'General D'armee' rule book a third time. The Swedish cavalry advances to screen the heights & allow their slower foot artillery to man the redoubt. 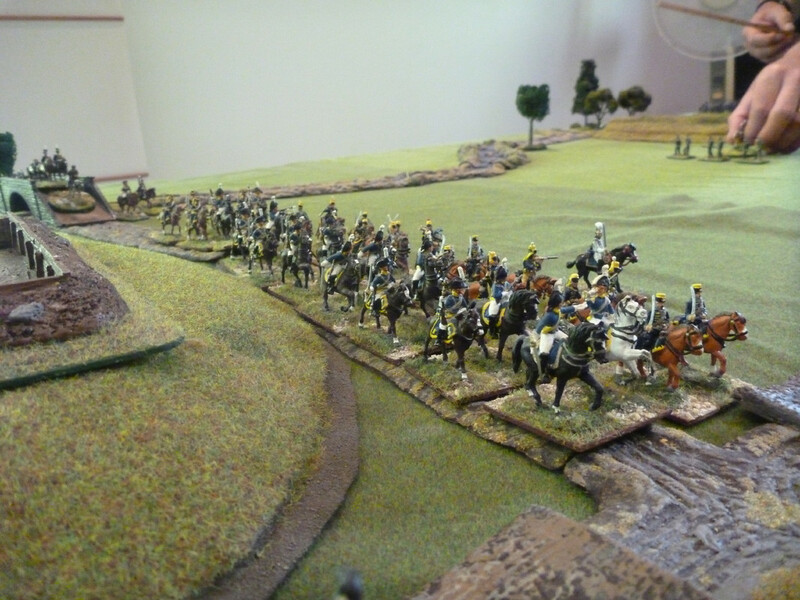 The Confederation infantry force marches to seize the village. 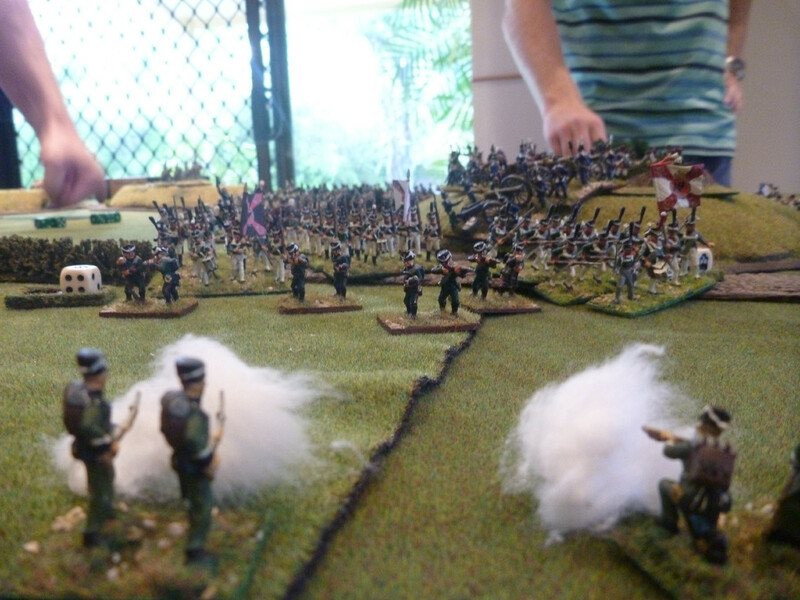 whilst army commander, General Poniatowski watches on. The Wurttemburg Line infantry garrison the village. Whilst the Russian infantry advances to menace the garrison. And the Wurttemburgers deploy light infantry skirmishers to slow the advance. Wurttemburg artillery fires on the redoubt. And Westphalian infantry mount an assault. The game more or less followed the same tactics as the first two. Clearly the best solutions to the tactical problems set by the scenario? Thank you for the kind comments. I certainly try to get "the look of the thing" as good as I can. I know that on a forum such as Bennos, filled with quality figures & excellent dioramas, a mere wargaming table looks a little lack lustre. I see a full table of nice painted figures! And that terrain looks terriffic to! Peter wrote: I see a full table of nice painted figures! And that terrain looks terriffic to! Not that it matters much but I think wargamers & figure painters/diorama makers are in separate hobbies. This doesn't mean we can't be pleasant to one another & share a forum (like we do at Bennos) but we are quite different animals. Hi, Peter is right. The figures and scenary look lovely. Your battle participants are a welcome change to the normal wargaming scenarios usually seen. I occasionally wargame with friends and can confirm that whilst wonderful scenary can be created it has to be practical and reusable. Transportation etc provide their own problems such as things falling apart en route. In my opinion the 'spirit' of thing is the important factor. Modellers enjoying and sharing the fruits of their endeavours. I also agree with Peter! Even though I don't game myself I do apprecieate (that looks odd!) a good table with nice figures and nice scenery! C M Dodson wrote: whilst wonderful scenary can be created it has to be practical and reusable. Transportation etc provide their own problems such as things falling apart en route. Every year, we put on a game at a local show run by & for model railway enthusiasts (you would know this because most of my posts here are of each year's game). We're the only wargame & though the railway people are used to us now, at first there were many strange looks. We now share some ideas & admire each others endeavours but, again, different animals. I would say model railways are in the same category as the excellent diorama work I admire here. If wargamers suggest an illusion, you folk create something close to reality. BTW thanks for the kind comments, all. Ochoin wrote: As advertised, we fought the smple scenario from the 'General D'armee' rule book a third time. Don't be so hard on yourself, Paul. Not drones, balloons. Cheaper, stay far longer. I know that the french army get 1794 two balloon company. One balloon was named L`Intrepide and an other L`Entreprenant. And later on Napoleon cancelled both units.